Shortly after Disneyland opened Friday morning, reports surfaced on Twitter that Mickey Mouse was out talking to guests outside his Toontown house. Not just posing for photos and signing autographs, but actually talking to and interacting with them. As word spread several MousePlanet readers tried to get to Disneyland in time to see Mickey, but the test ended too soon. Last May, Disneyland conducted a brief meet-and-greet test with Mickey in the controlled environment of his Toontown house. A video posted on the Disney Parks Blog after that test showed Mickey talking, blinking, and greeting visitors by name. Last October, the new Disney Dance Crew show opened at Disney California Adventure Park, featuring a Mickey who could move his mouth and blink, but when Mickey comes out after the show to sign autographs he doesn't speak. During a presentation in February's Disney Investor Conference, Walt Disney Parks & Resorts Chairman Tom Staggs talked about new meet-and-greet locations being built in Florida's Magic Kingdom for the Disney princesses, saying, "the tools that we’re creating will allow them to greet and interact with our guests in an immersive and highly personalized way." Walt Disney World recently announced that they are building a new meet-and-greet location for Mickey Mouse in the Magic Kingdom, and speculation that this new venue may feature the talking Mickey character has only increased following Disneyland's latest test. Mickey's new meet-and-greet area at Disney California Adventure is decorated in a nautical theme. Photo by Adrienne Vincent-Phoenix. Over in Disney California Adventure park, Mickey Mouse has a new nautically themed meet-and-greet area in Paradise Pier, near Ariel's Grotto restaurant and the meet-and-greet area for Duffy the Disney Bear. 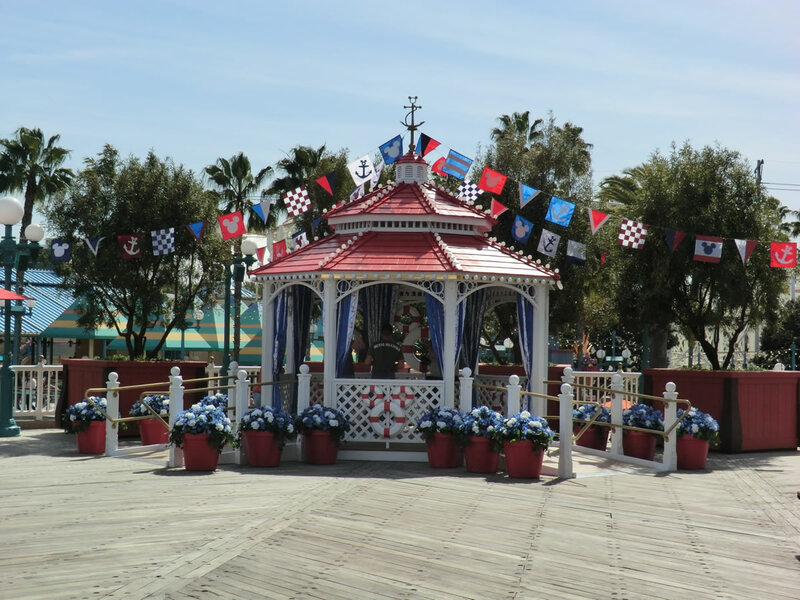 Mickey's new place is a large shaded gazebo with wheelchair-accessible ramps, decorated with a nautical motif that matches Duffy's hangout. 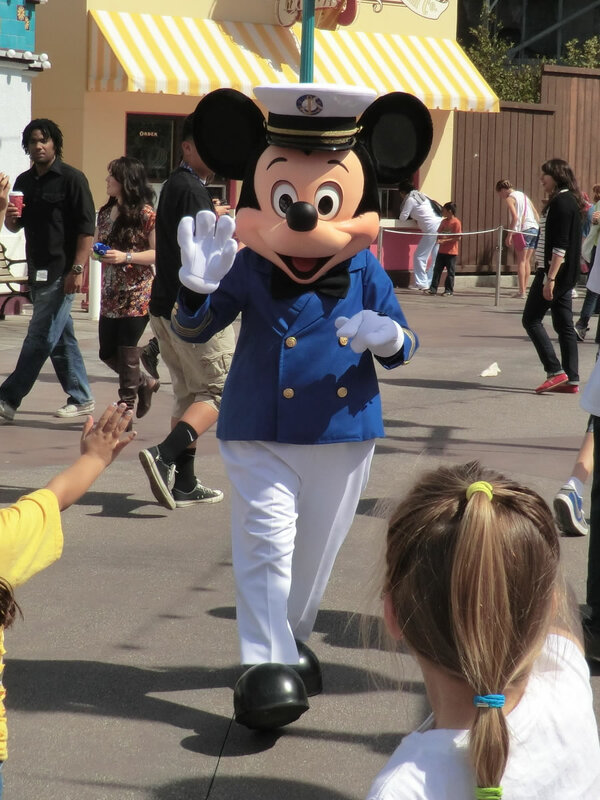 Mickey now poses for photos wearing a jaunty outfit that cast members call a sailor suit, but looks a version of the costume Mickey wears on the Disney Cruise Line. As is to be expected, a Photopass photographer is on hand to capture your meeting with Mickey. Mickey Mouse has a new sailor suit for his DCA meet-and-greet. Photo by Adrienne Vincent-Phoenix. Disney has announced the dates for the 2011 Grad Night events. The after-hours parties for graduating high school seniors are scheduled for May 12, 19, and 26; and June 2, 8, 9 and 16. Although park hours for these dates are released until 60 days in advance, we can expect based on last year's schedule, that Disneyland will likely close around 9:00 p.m. on event nights. In 2010 Disney California Adventure closed at 6:00 p.m. most nights for the pre-Grad Night "blast off" party. However with the continued performances of World of Color, it's uncertain whether the park will close early or if park managers will find a way to accommodate both the World of Color crowds and the high school seniors. Service animals can continue to use the Disneyland Kennel or any open outdoor area outside of the parks. 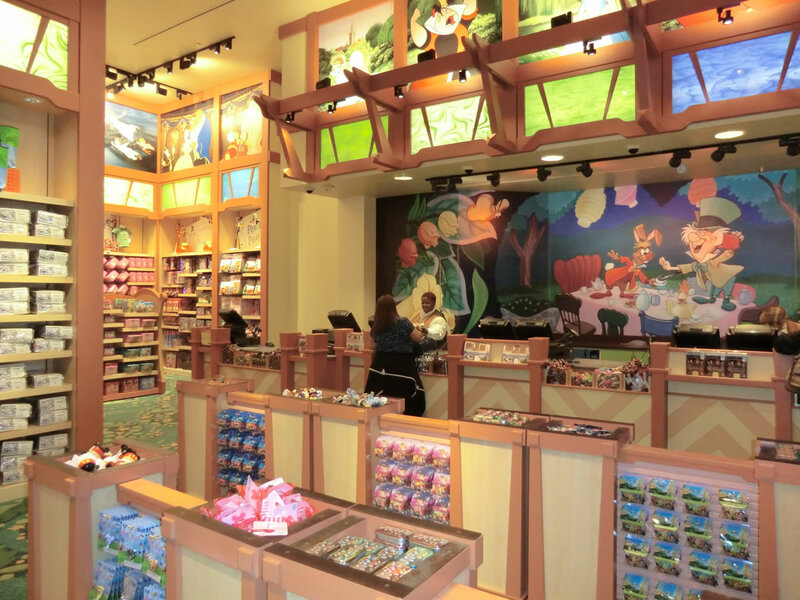 This past weekend, Downtown Disney's World of Disney Store completed the largest phase of a months-long renovation project, and unveiled a completely renovated toy and plush room. 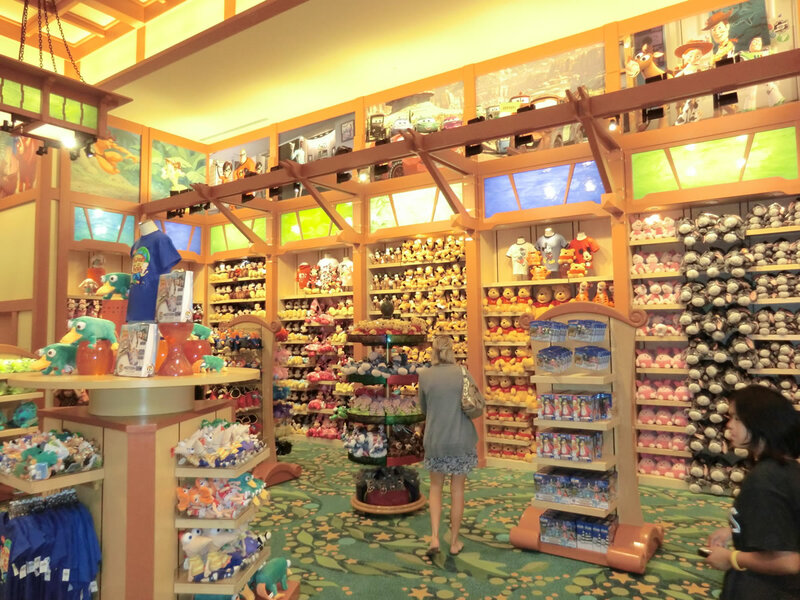 Gone is the cubby-style wall of plush toys with a base that served as an unfortunate catch-all for unwanted merchandise discarded by careless shoppers, replaced with an easier-to-merchandise shelved wall. 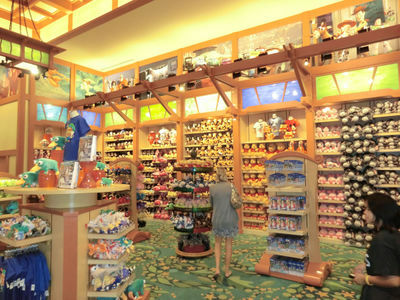 The World of Disney store unwrapped a new toy and plush room this weekend. Photo by Adrienne Vincent-Phoenix. 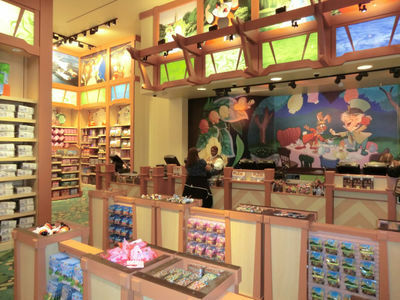 The cash register area has been slightly expanded, and new low fixtures create a queue full of impulse buy items Disney hopes you'll add to your shopping basket before you reach the register. The lighting in the room is much brighter, and new art panels line the walls just below the ceiling. The queue is now formed with low, merchandise-filled dividers. Photo by Adrienne Vincent-Phoenix. New artwork borders the ceiling of the World of Disney store. Photo by Adrienne Vincent-Phoenix. Construction has "gone vertical" at two major sites around the Disneyland Resort this week. 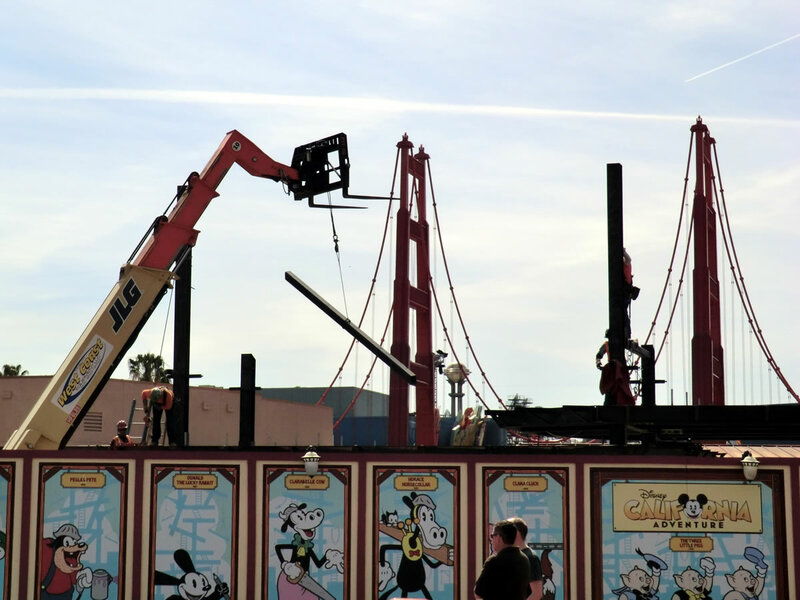 The framework of DCA's new main entrance structure is now visible over the construction walls, and workers were lifting new steel beams into place Saturday. 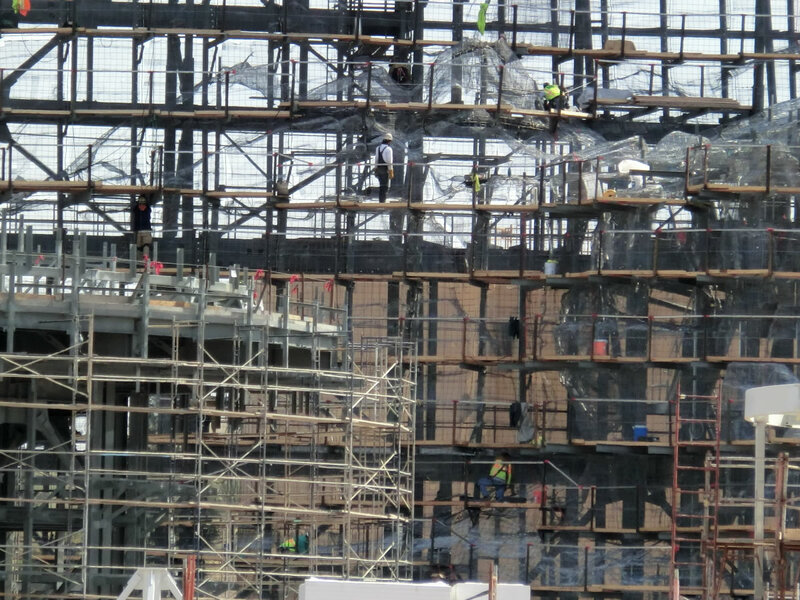 Workers raise a steel beam into place atop the new DCA main entrance structure. Photo by Adrienne Vincent-Phoenix. 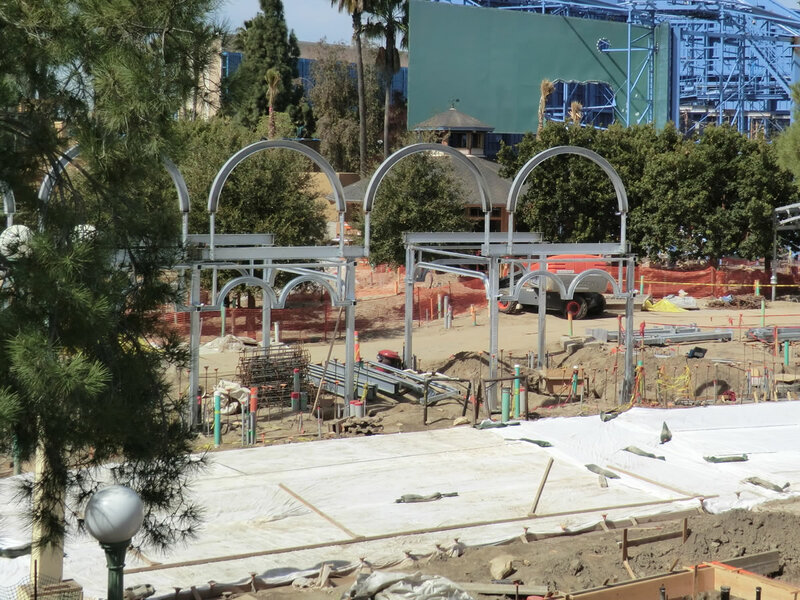 The new DCA main entrance structure is taking shape. Photo by Adrienne Vincent-Phoenix. 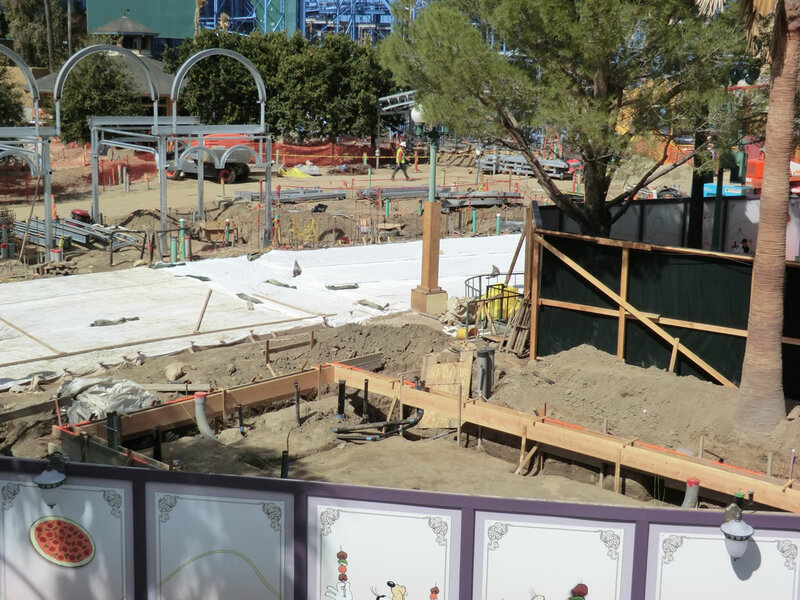 Over in Paradise Pier, the seating area for the two refurbished restaurants is starting to take shape, and the foundation of what we've been told will be a beer kiosk has been marked. It also appears that the concrete pad of the future pizza restaurant was poured last week. Workers are still constructing the facade of the building, which is expected to reopen in late May. 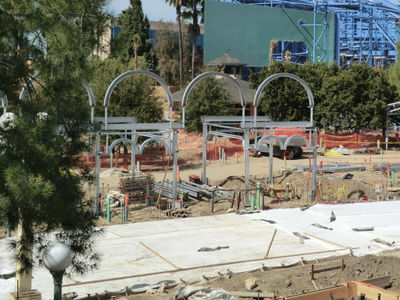 The dining patio for the Paradise Pier restaurants is taking shape. Photo by Adrienne Vincent-Phoenix. The foundation for the beer kiosk is taking shape. Photo by Adrienne Vincent-Phoenix. 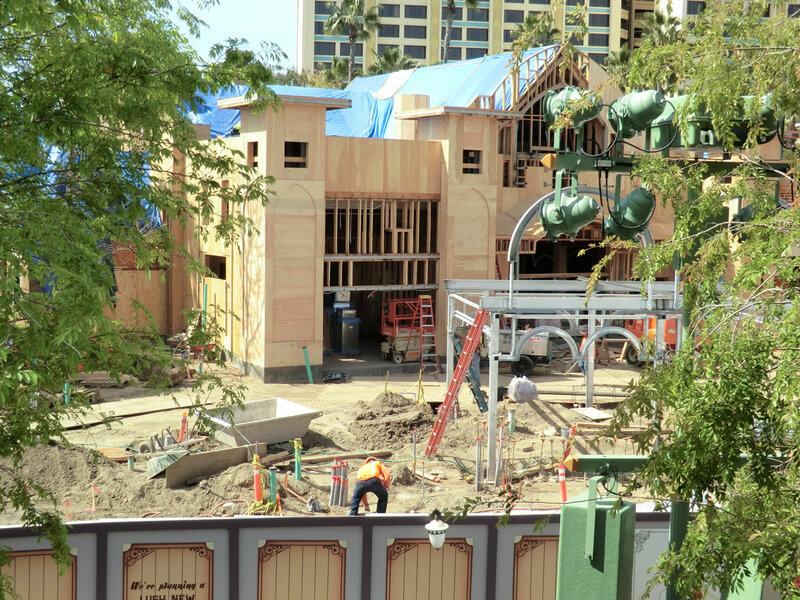 Workers are still finishing the framing of the pizza and pasta restaurant. Photo by Adrienne Vincent-Phoenix. The new concrete pad has been poured in the pizza and pasta restaurant. Photo by Adrienne Vincent-Phoenix. Workers on the roof of the pizza and pasta restaurant Saturday afternoon. Photo by Adrienne Vincent-Phoenix. 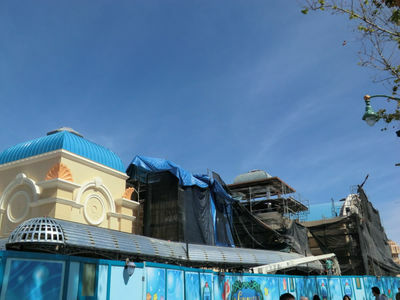 Many of the scrims around the Little Mermaid building were lowered or blown off by the winter winds last week, revealing more of the building. 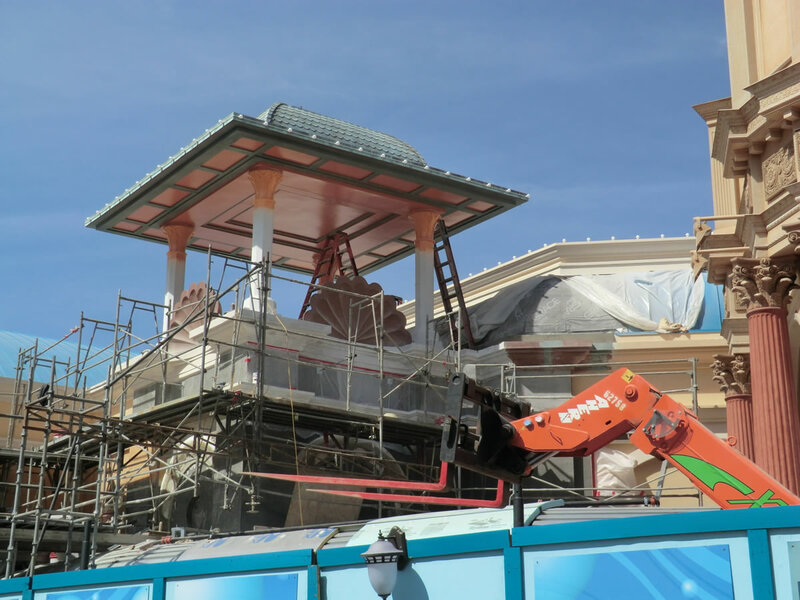 The antiqued finish of one tower is visible in the Little Mermaid building. Photo by Adrienne Vincent-Phoenix. Work continues on the new Little Mermaid attraction building. Photo by Adrienne Vincent-Phoenix. 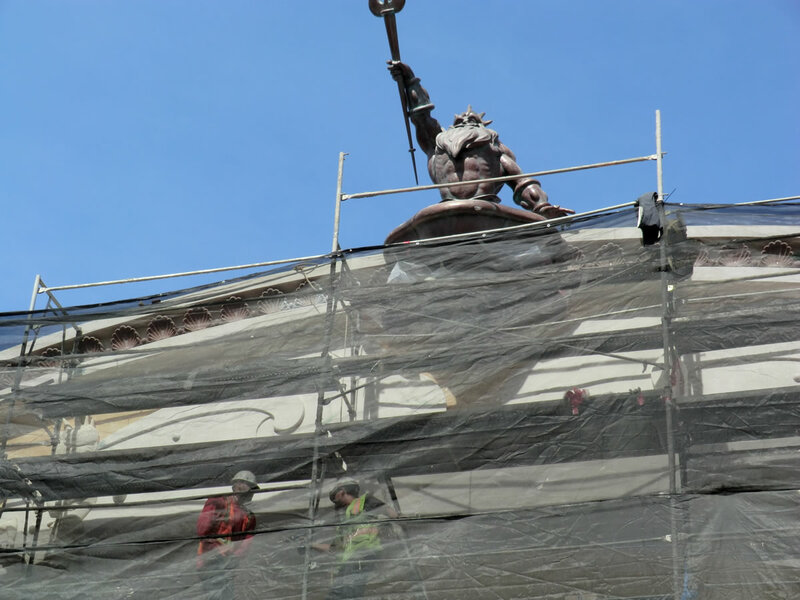 Workers stand on scaffolds in front of the frieze on the Little Mermaid building. Photo by Adrienne Vincent-Phoenix. 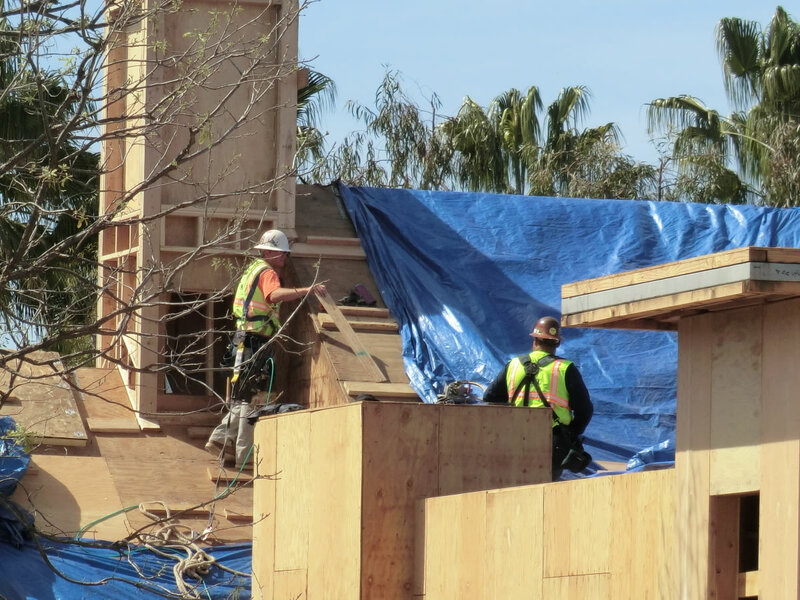 A new structure appeared atop Goofy's Sky School last week, and workers were continuing to build a new tower outside the attraction. A new frame, perhaps for a sign, was added to Goofy's Sky School. Photo by Adrienne Vincent-Phoenix. 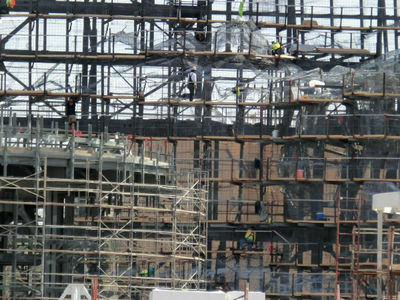 Welders work on the tower outside Goofy's Sky School. Photo by Adrienne Vincent-Phoenix. 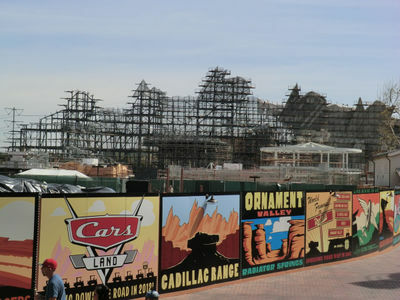 Work continues on the Cadillac Range surrounding Cars Land. Photo by Adrienne Vincent-Phoenix. Welders were hard at work on the Cadillac Range last Saturday. Photo by Adrienne Vincent-Phoenix. We're going on a menu hunt —care to join us? We're looking for volunteers to help update our database of Disneyland Resort menus next Sunday, March 20. Volunteers need to be available from about 9:00 a.m. to 1:00 p.m. on Sunday, have valid admission to Disneyland and Disney California Adventure, and bring a digital camera with a removable memory card. Lunch is provided. If you're interested, please send us an e-mail. For brand-new teams who just want to get an idea of what this MouseAdventure thing is all about without the stress of competition, our MouseAdventure 101 event is for you. Try your hand at a series of classic MouseAdventure puzzles from past events in Disney California Adventure in a relaxed, non-competitive setting. Register now at MouseAdventure.com. Visit the site for more information, and sign up for the MouseAdventure Newsletter. ...Mechanical problems forced Disneyland's Sailing Ship Columbia to remain in port this weekend, prompting Disneyland to cancel all performances of Fantasmic! this past Saturday and Sunday. Cast members tell us there is a problem with the underwater track which keeps the Columbia and the Mark Twain on course as they circle Tom Sawyer Island. Both ships were idle Saturday as divers were sent into the Rivers of America Saturday to evaluate the problem. The Mark Twain reopened Sunday, but the Columbia remained in dock due to what is rumored to be a faulty track switch. To help accommodate the crowds Saturday, Disney California Adventure added a third performance of World of Color. Fantasmic is not scheduled Monday - Thursday this week, and it's unknown if repairs can be made in time for the show to return as scheduled on Friday. The Columbia was already scheduled to be closed for a brief refurbishment this Monday - Wednesday. ...Disney has released the March, 2011 merchandise newsletter with information about the product releases and promotions offered at the domestic Walt Disney Parks and Resorts. We've posted the 12-page document on our MousePad discussion forum for you to browse. ...Footwear retailer Sanuk is returning to Downtown Disney later this month, and will move into the space formerly occupied by Basin. Sanuk opened temporary store in Downtown Disney in November 2009, but closed the following March when neighboring Ridemakerz expanded its own temporary location into a larger permanent store. 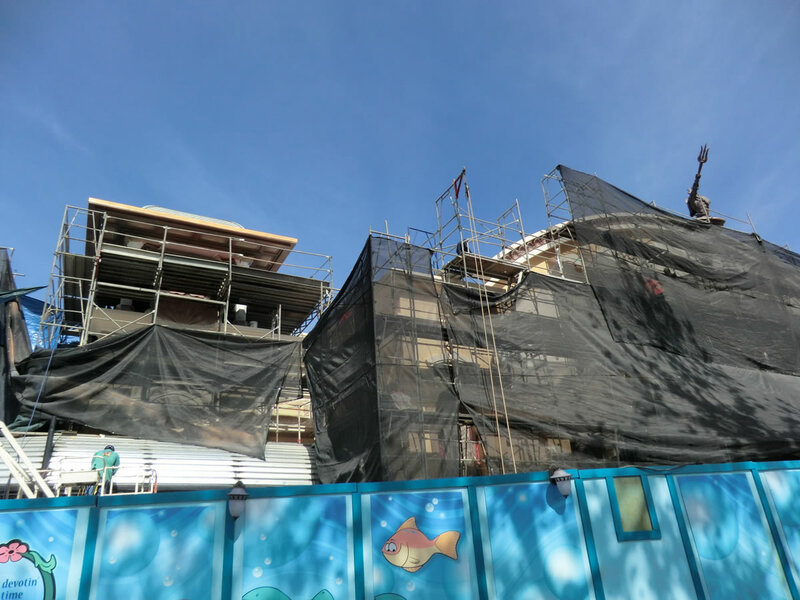 According to an article at the Orange County Register Sanuk's marketing manager said they were hoping to find a permanent location in Downtown Disney, but at the time there were no vacancies. ...The Anne Geddes store in Downtown Disney is now closed. Disney has not announced what new tenant may move into that space. Screening of all three Pirate of the Caribbean films plus a screening of Pirates of the Caribbean: On Stranger Tides before the midnight show. Tickets for the Pirates Movie Marathon are available by phone only at (818) 845-3110. If you don't want to sit through the marathon and can stand to wait a few more hours to get a peek at the fourth in this popular franchise, the El Cap is also hosting a midnight screening of Pirates of the Caribbean: On Stranger Tides at 12:01a.m. on Friday, May 20. Tickets for the midnight screening are available from ElCapitanTickets.com. 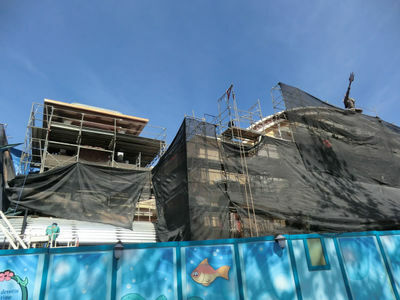 ...Visitors planning trips to the Disneyland Resort should make a point to check the Current Refurbishment/Attraction Closures section each week for the most recent updates. 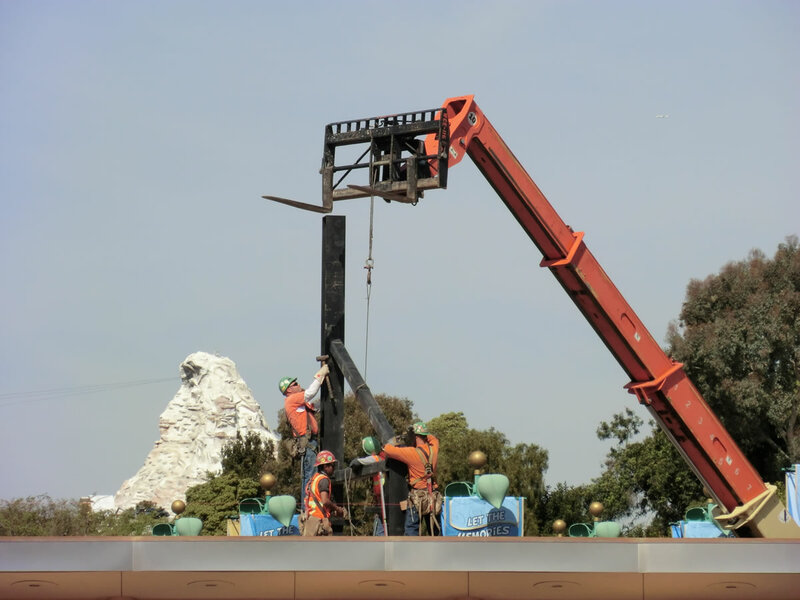 The Disneyland Resort Web site currently only publishes refurbishment information about six weeks in advance. Be sure to check the most recent Disneyland Resort Update for the latest changes, as MousePlanet does not edit past Park Updates to reflect changes. 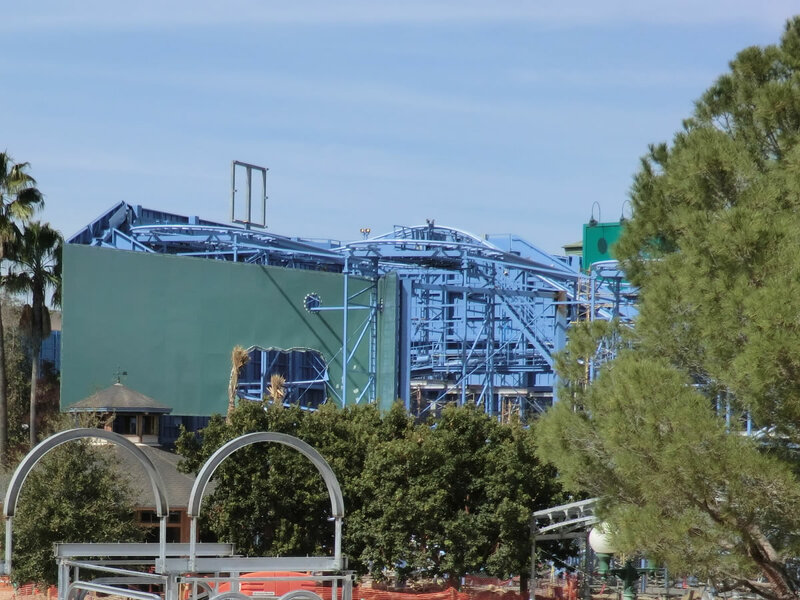 Star Tours – closed for refurbishment and addition of elements for Star Tours 2.0. Star Trader – closed through April 30 for refurbishment. The store has been relocated to the Starcade during construction. Splash Mountain – closed through May 26 for refurbishment. The Many Adventures of Winnie the Pooh – closed through March 9 for refurbishment. Davy Crockett Explorer Canoes – closed through March 9 for refurbishment. 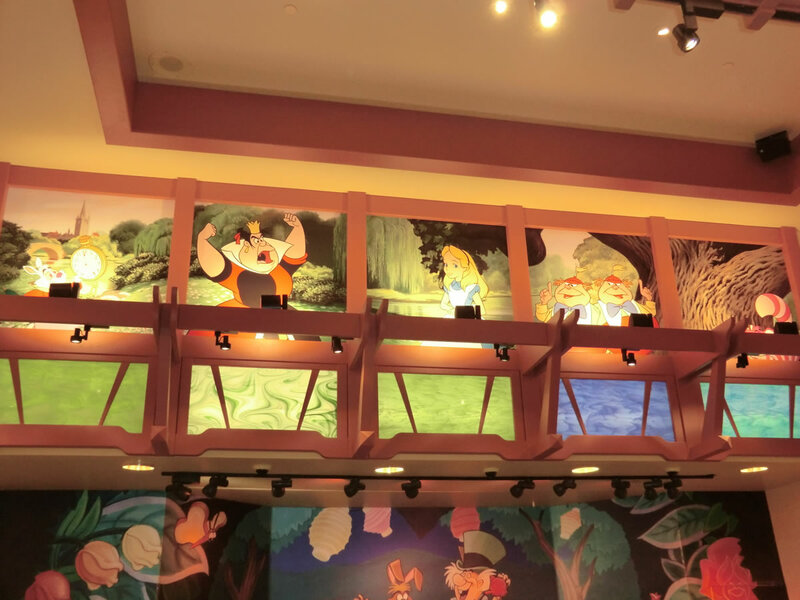 Hungry Bear Restaurant – closed through March 17 for refurbishment. Pooh's Corner – closed through March 9 for refurbishment. Briar Patch – closed through March 9 for refurbishment. Sailing Ship Columbia – closed March 7–9 for refurbishment. Goofy's Playhouse – closed March 7–10 to replace the flooring. Burger Invasion – closed through May 24 for conversion into Paradise Garden Grill. Corn Dog Castle – closed due to construction in the area. An employee publication lists May 25 as its return date. Souvenir 66 – closed due to construction in the area. An employee publication lists May 25 as its return date, and "Seaside Souvenirs" as the new name of the store. Pizza Oom Mow Mow – closed through May 24 for conversion to Boardwalk Pizza and Pasta. Mulholland Madness – closed through May 24 for conversion to Goofy's Sky School. 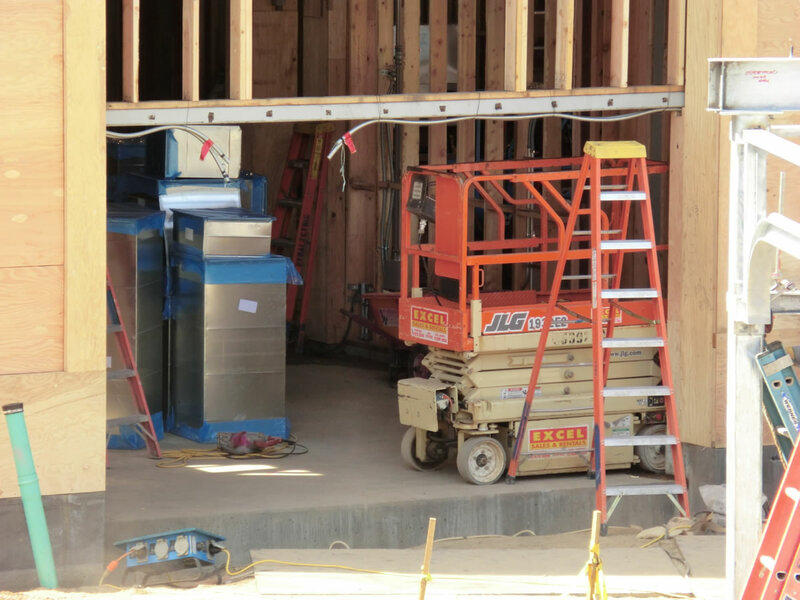 Disneyland Hotel Guest Laundry – closed due to construction. Hotel guests can use the laundry facility at Disney's Paradise Pier hotel during the refurbishment. 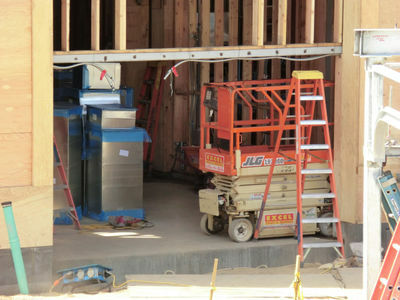 Disneyland Hotel Fitness Center – closed due to construction. The fitness center equipment has been relocated to one of the hotel meeting rooms; ask the front desk for the most recent information as you check in. Lost Bar, Croc's Bits 'n' Bites, Hook's Pointe and the Wine Cellar – closed. 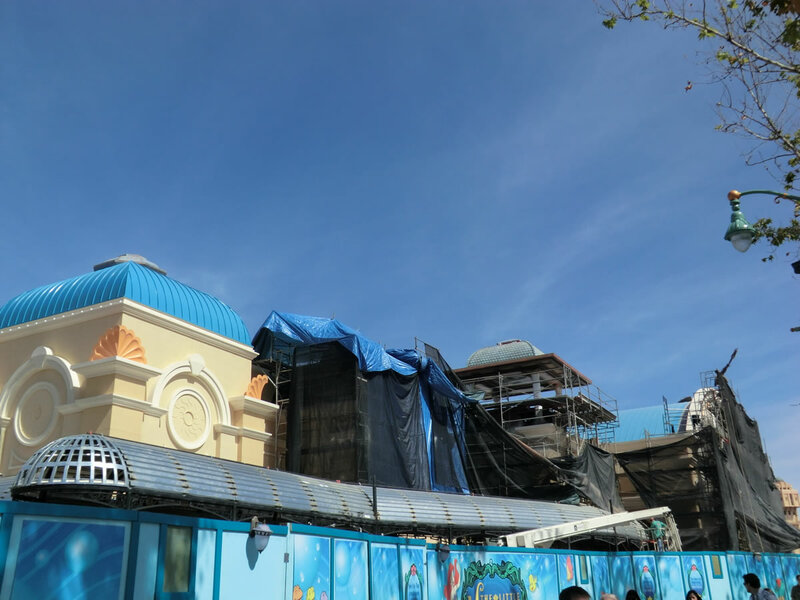 These four locations will be replaced by a new bar and fast casual restaurant during the ongoing Disneyland Hotel courtyard renovation project. During construction, the only remaining bar at the Disneyland Hotel is the Lounge at Steakhouse 55, which has extended its operating hours, and will be closing at 1:30 a.m. nightly. Check here to see if a large convention, competition or park event might fall during your next trip to the Disneyland Resort. If you know of any in-park events, official or unofficial, that should be listed here, please send us an e-mail. ElecTRONica – Friday, Saturday and Sunday nights through Labor Day weekend. Spring 2011 MouseAdventure at the Disneyland Resort – Sunday, April 10. The Basic and Advanced divisions are now full, but registration is still open for the 101 Division, created especially for first-time team. Visit MouseAdventure.com for more information and to sign up for the MouseAdventure newsletter. AIDS Walk Orange County – May 1. Registration information available on the event Web site. Grad Night events – The after-hours parties for graduating high school seniors will be held Thursday, May 12; Thursday, May 19; Thursday, May 26; Thursday, June 2; Wednesday, June 8; Thursday, June 9 and Thursday, June 16. Disneyland and Disney's California Adventure close earlier on these nights to prepare for the after-hours graduation parties. D23 Expo – August 19–21 at the Anaheim Convention Center. Tickets for the D23 Expo 2011 are now on sale at the event Web site. Sixth annual Disneyland Half Marathon Weekend – September 2–4. Registration for the 2011 event is now open at the Run Disney Web site. Fall 2011 MouseAdventure at the Disneyland Resort – no details yet. Visit MouseAdventure.com to sign up for our newsletter. Fall 2011 MouseAdventure at Walt Disney World – Saturday, November 12. Visit MouseAdventure.com to sign up for our newsletter. We also recommend checking the convention calendar at the Anaheim/Orange County Visitor and Convention Bureau Web site. When looking at that site, remember to note both the number of people and the number of rooms resulting from each convention. A gathering of 25,000 people booking few room nights (indicating most will be driving in to the area for their meeting) can impact traffic around the Resort much more than a crowd of 25,000 staying in area hotels. Of course, that second group is going to make finding a hotel room more difficult (and possibly more expensive), so it's best to book your own room as early as possible if you see that a big convention is in town during your trip. This first section is a list of discounts on ticket-only purchases. Though it has become more common in recent years, Disneyland tickets are rarely offered at deep discounts unless you are a resident of Southern California or Northern Mexico. For residents outside that area, the best discounts available tend to be simple advance purchase discounts. Resident 2-Day 1-Park per Day ticket ($99) – The Resident 2-Day 1-Park per Day ticket offers Southern California residents (ZIP Codes 90000–93599) and Northern Baja California residents (ZIP Codes 21000–22999) two one-day admissions to either Disneyland or Disney California Adventure before May 14. The ticket is the same price for adults and children. This base ticket is NOT a park hopper, and allows admission to only one park per day. For an additional $10 per person, you can upgrade the ticket to a Park Hopper ticket that allows admission to both parks each day, a savings of up to $52 compared to the box office price of a two-day park-hopper ticket. There is no "fuse" on this ticket, which means you can use the first admission today and wait until May to use the second admission, but the ticket must be purchased by April 15 and the ticket expires May 14. There are no blockout dates for this ticket. The ticket can be purchased online at Disneyland.com and printed from home for immediate use, and is also available at the Disneyland Resort ticket booths. You can also purchase the ticket at participating Disney Stores and authorized third party ticket outlets, including many local grocery stores. Keep in mind that Disney states "proof of residency required for purchase and admission," but MousePlanet readers who purchased these tickets from off-property retailers last year consistently reported that they were not required to provide proof of residency at the time of purchase. However, be aware that Disneyland Resort Main Gate cast members can—and may—require proof of residency when you first use the tickets. 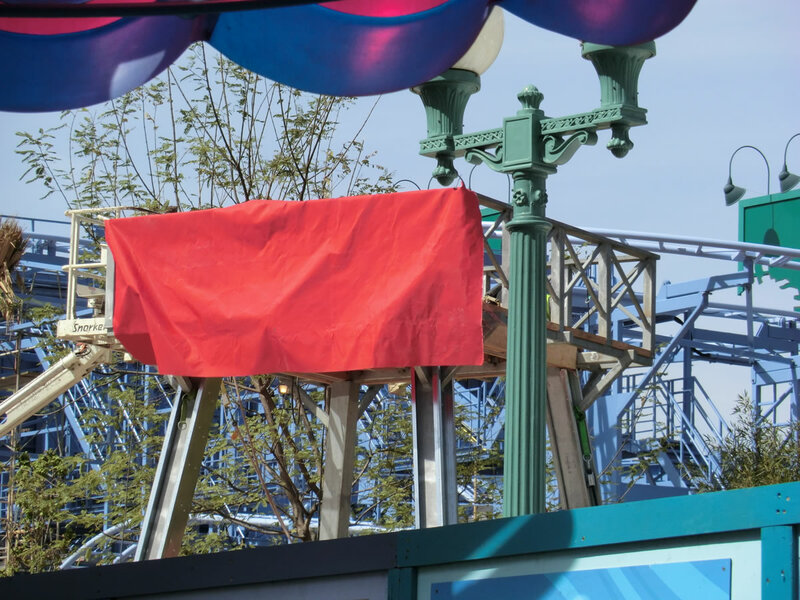 Whether this will happen to you is an oft-debated topic on our MousePad discussion boards, but we feel it would be irresponsible for us to not at least make our readers aware of the "official" policy, regardless of what the park's actual practice may be. Tickets valid for Southern California residents within ZIP codes 90000-93599 and Northern Baja California residents within ZIP codes 21000-22999. Proof of residency required for purchase and admission. The Resident 2-Day 1-Park per Day Ticket entitles Guests to admittance to either Disneyland® Park or Disney California Adventure™ Park each day for two days. This ticket is not valid for visits to both theme parks on the same day. The first visit must occur on or before May 14. Tickets may only be purchased between January 2 and April 14. Disney Military Promotional 3-Day Park Hopper Ticket ($99) – A discounted price offered to active or retired U.S. military personnel or their spouses. Based on past offers, Disney defines "Eligible Service Members" as active or retired members of the U.S. military, including active members of the National Guard or Reservists and active or retired members of the U.S. Coast Guard. This discount is available at MWR/ITT offices at your military base, or at the Disneyland Resort ticket booths. Valid military ID is required. The price is the same for adults and children, and total of six tickets may be purchased per military member, regardless of who purchases the tickets (the member or their spouse). Tickets must be purchased by September 28 and used by October 1. The ticket has the following 2011 blockout dates: February 18–21; April 17–23; and July 1–4. Promotional 3-Day Park Hopper Bonus Ticket ($169/$152) – A discounted price offered with advance purchase through the Disneyland Resort Web site. This discount is not available at the theme park ticket booths, you must purchase online before you arrive. Tickets are valid January 4 to April 14. Tickets must be purchased by, and first day of use must occur on or before, April 14. Tickets expire 13 days after the first day of use or April 27, whichever occurs first. "Promotional Tickets" include one early admission day (Monday, Tuesday, Thursday, or Saturday). Advance Purchase 3-day Park Hopper Bonus Ticket ($186/$165) – A discounted price for advance purchase through the Internet or select dealers. Available at the Disneyland Resort Web site where shipping is included if you order more than 10 days prior to your travel date. Also available from AAA offices in Northern California, Nevada, and Utah (not currently listed at the AAA Web site, you may need to call your local office). Disney Stores (California), Safeway supermarkets (California and Arizona), and certain travel agents may also sell these tickets. It is best to call and confirm before visiting a location, however. "Bonus Tickets" include one early admission day (Monday, Tuesday, Thursday, or Saturday). If purchased from AAA, the tickets come with free parking at the Mickey & Friends parking garage (a $15/day value). Costco 4-Day Park Hopper Ticket ($199) – A special offer for Costco members who are also residents of Southern California, this ticket is currently not sold online but must be purchased in Costco stores. Unlike most other park hopper tickets, this ticket has no "fuse" - you can use the first admission today, and have until May 31 to use the remaining admission days before the ticket expires. The ticket is blocked out August 22-23 and the entire period between Dec 15, 2010 – Jan 1, and has an "upgrade value" of $151. The ticket states that visitors "Must reside within ZIP codes 90000-93599" and that "Proof of residency required upon redemption." The ticket you purchase at Costco is a valid admission ticket, and you can take it directly to a main entrance gate to use it. We've been told that, to prevent the unauthorized "transfer" of tickets between visitors (i.e., you use the first two days of the ticket and give it to a friend to use the second two days), visitors will be required to write their name on the ticket when it is first used for admission, and to show ID with that same name upon subsequent admissions. Obviously minor children will be exempt from the ID requirement, but will also be required to write their name on the ticket when it is first used. Adults should plan to have ID with them to use the ticket. Promotional 4-Day Park Hopper Bonus Ticket ($182/$163) – A discounted price offered with advance purchase through the Disneyland Resort Web site. This discount is not available at the theme park ticket booths, you must purchase online before you arrive. Tickets are valid January 4 - April 14. Tickets must be purchased by, and first day of use must occur on or before, April 14. Tickets expire 13 days after the first day of use or April 27, whichever occurs first. "Promotional Tickets" include one early admission day (Monday, Tuesday, Thursday, or Saturday). Advance Purchase 4-Day Park Hopper Bonus tickets ($201/$178) – A discounted price for advance purchase through the Internet or select dealers. Available at the Disneyland Resort Web site where shipping is included if you order more than 10 days prior to your travel date. Also available from AAA offices in Northern California, Nevada, and Utah (not currently listed at the AAA Web site, you may need to call your local office). Disney Stores (California), Safeway supermarkets (California and Arizona), and certain travel agents may also sell these tickets. It is best to call and confirm before visiting a location, however. "Bonus Tickets" include one early admission day (Sunday, Tuesday, Thursday, or Saturday). If purchased from AAA, the tickets come with free parking at the Mickey & Friends parking garage (an $15/day value). These tickets are now valid through January 3. Promotional 5-Day Park Hopper Bonus Ticket ($192/$172) – A discounted price offered with advance purchase through the Disneyland Resort Web site. This discount is not available at the theme park ticket booths, you must purchase online before you arrive. Tickets are valid January 4 - April 14. Tickets must be purchased by, and first day of use must occur on or before, April 14. Tickets expire 13 days after the first day of use or April 27, whichever occurs first. "Promotional Tickets" include one early admission day (Monday, Tuesday, Thursday, or Saturday). Advance Purchase 5-Day Park Hopper Bonus tickets ($211/$186) – A discounted price for advance purchase through the Internet or select dealers. Available at the Disneyland Resort Web site where shipping is included if you order more than 10 days prior to your travel date. Also available from AAA offices in Northern California, Nevada, and Utah (not currently listed at the AAA Web site, you may need to call your local office). Disney Stores (California), Safeway supermarkets (California and Arizona), and certain travel agents may also sell these tickets. It is best to call and confirm before visiting a location, however. "Bonus Tickets" include one early admission day (Sunday, Tuesday, Thursday, or Saturday). If purchased from AAA, the tickets come with free parking at the Mickey & Friends parking garage (a $15-per-day value). Promotional 3-Day Park Hopper Bonus Ticket ($196/$176) – A discounted price offered with advance purchase through the Disneyland Resort Web site. This discount is not available at the theme park ticket booths, you must purchase online before you arrive. Tickets are valid January 4 - April 14. Tickets must be purchased by, and first day of use must occur on or before, April 14. Tickets expire 13 days after the first day of use or April 27, whichever occurs first. "Promotional Tickets" include one early admission day (Monday, Tuesday, Thursday, or Saturday). Advance Purchase 6-Day Park Hopper Bonus tickets ($216/$190) – A discounted price for advance purchase through the Internet or select dealers. Available at the Disneyland Resort Web site where shipping is included if you order more than 10 days prior to your travel date. Also available from AAA offices in Northern California, Nevada, and Utah (not currently listed at the AAA Web site, you may need to call your local office). Disney Stores (California), Safeway supermarkets (California and Arizona), and certain travel agents may also sell these tickets. It is best to call and confirm before visiting a location, however. "Bonus Tickets" include one early admission day (Sunday, Tuesday, Thursday, or Saturday). If purchased from AAA, the tickets come with free parking at the Mickey & Friends parking garage (a $15/day value). No discounts currently available for new purchases. Southern California residents can take advantage of the monthly-payment plan when purchasing any but the Premier Annual Passport. 2011 Southern California CityPass ($276/$229) – This pass includes a 3-Day Disneyland Resort Park Hopper Bonus Ticket (including one early-entry day), a one-day admission to either San Diego Zoo or San Diego Wild Animal Park, as well as one-day admission to Sea World San Diego and Universal Studios Hollywood. The CityPass expires 14 days after first use at any location, and the first use must occur by January 3. Purchase CityPass through the Disneyland Resort Web site or on-site at the ticket booths of Disneyland Resort or the other theme parks included in the pass. You can also purchase directly from the CityPass Web site though this has a minimum $7.50 shipping charge (no shipping charge from the Disney Web site if purchased more than 10 days in advance). You can also purchase the Southern California City Pass online from Costco.com at a cost of $259.99/$209.99, which includes free UPS shipping. A 5% surcharge for non-members, and shipping fees to members in Alaska and Hawaii may also apply to your purchase. Booklets may be available for sale in some stores but varies widely. If you want to buy in person it would be best to call ahead and confirm availability. If you do buy at Costco, you will initially purchase a large plastic container or a cardboard placard that you must trade for ticket books prior to leaving Costco! Spring discount offers – In addition to the Promotional Park Hopper bonus tickets listed above, the Disneyland Resort released two hotel discounts for Spring 2011. We definitely recommend comparing prices on these offers before you buy, as it may be less-expensive to book the hotel and ticket separately. The Resort is offering discounts of up to 35 percent on select Disneyland Resort Hotel stays for arrivals January 2 through April 13. Travel must be booked by February 19, and a two-night minimum stay is required. Offer is not valid January 14 & 15, or February 18 & 19. Discount applies only to standard and concierge level rooms. There is a limit of two rooms per reservation, and a maximum of five people per room. Book a three-night, four-day package at a Disneyland Resort Hotel and get a fourth night free. Package includes four nights at a Disneyland Resort Hotel and four-day park hopper bonus tickets for a family of four. This offer is valid for arrivals from January 4 through April 11; travel must be completed by April 15. This package also includes one collectible pin, lanyard and luggage tag per person; one $20 ESPN Zone game card per package, admission to Mickey's Toontown Morning Madness, preferred seating at select shows in DCA, and a "character call" from a Disney character. Book online at the Disneyland Resort Web site, call Walt Disney Travel Company at (714) 520-6425, or contact your favorite travel agent and ask them to look for the "Spring Package Offer." Costco Travel Packages – Many different travel packages including visits to Disneyland and Disneyland hotels are available through Costco.com. When purchasing a Costco Disneyland travel package, extras that will be included are: Mickey's Toontown Madness admission (currently available Mondays, Wednesday, Fridays, and Saturdays), a character breakfast collectible pin and lanyard, and a Costco luggage tag per person, plus a $20 Disneyland Resort gift card per package. Disney's Resort Magic and Good Neighbor Magic Packages – Package includes accommodations one of the three resort hotels or at one of 40 Good Neighbor hotels; Souvenir Park Hopper ticket with voucher for admission to Mickey's Toontown Morning Madness, plus one Magic Morning (early entry) for three-day or longer Park Hoppers; preferred seating at four DCA attractions (Disney's Aladdin – A Musical Spectacular, Muppet*Vision 3D, It's Tough to be a Bug!, Golden Dreams); Preferred Showing of Turtle Talk with Crush (Priority Viewing at the first Turtle Talk with Crush show of the day, on any one day - one voucher per Guest); Disney Dream coin keepsake (one per package), luggage tag and lanyard with pin; a Downtown Disney Fun Card; and a "Character Call" from Mickey, Minnie, Goofy or Crush. Contact Disney Travel or your favorite travel agent. Disney Visa Discounted Stroller Rental – If you have a Disney Visa card you can rent up to two strollers at a discount of 50%. This offer is valid only at the Main Gate rental location between Disneyland and Disney California Adventure. Rainforest Cafe Safari Club – Members of the Rainforest Cafe get priority seating when available (which makes a huge difference on busy days), and a 10% discount on entrees for up to four people. Additionally, after signing up, your membership card will be mailed to you and be accompanied by a $10 award good for your next visit to a Rainforest Cafe. So if you know you will be eating there while at Disneyland and have a Rainforest Cafe local to you, it may make sense to prejoin the Safari Club so that you can use the award during your trip. See the Rainforest Cafe Web site for details. ESPNZone MVP Club – Membership in the MVP Club does not offer any discounts on food. However, once a member you can make an online reservation for your party up to three days in advance and will get a 25% increase in points purchased when playing games in the Sports Arena (and 40 bonus points at activation). You must register online at ESPNZone.com and your membership card will then be mailed to you within two weeks. The card must then be activated at any ESPNZone by the person who signed up for the card and ID will be required. Entertainment schedule: This week's entertainment schedule on the Disneyland Resort Web site. I'm trying to send an email (I've tried twice) to volunteer for the Menu Hunt, but it keeps getting bounced with a "Message Rejected" status. Are you still looking for people to do this? If so, my wife and I are interested! Could you forward the bounce message to andrew@mouseplanet.com please? I'll look into it. Andrew, I've just forwarded it to you. Thanks!